This is the last of the proposed redesigns for the unfilmed fourth live-action TMNT movie. 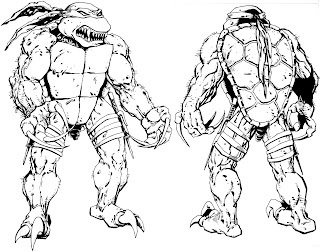 One of our ideas was to give Raphael the ability to “morph” into what we were calling “Raptor Raph”, complete with big gnashy teeth and claws to complement his big gnashy personality. This was not much of a stretch, obviously. In retrospect, while this new approach was probably appropriate for Raph, it was also uncomfortably close to what we were proposing for Splinter. Its really neat to see how the idea morphed though. I seriously have to wonder if CBS took this idea from you when having the turtles change in the show, it looks almost exactly like this. -->> ..reminiscent of ' BIZ' ..
the raph fan in me hopes he's back to normal soon! get that next issue out!! I hope the next volume 4 issue is out soon I almost forgot about the series sadly! Any update on a release date yet Peter??? ?